FRANCE: Vestas is set to supply the 2MW turbine for Ideol's floating offshore wind platform currently under construction in St-Nazaire, CEO Paul de la Gueriviere has revealed. Gamesa was originally tipped to provide the turbine for the Floatgen demonstrator. That fell through, however, when Adwen — the Gamesa-Areva offshore joint venture — decided not to be involved in the project. The Vestas machine arrived at St-Nazaire in June and will undergo "minor modifications", Ideol said, before being loaded onto the concrete floater. 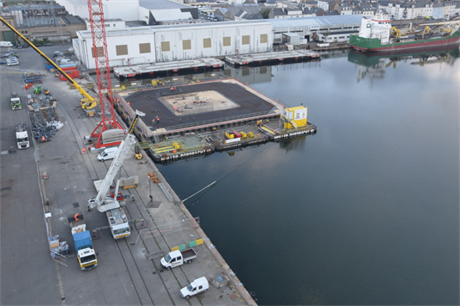 Bouygues Travaux Pulics is building the concrete floater, while a consortium led by Breton company Le Beon Manufacturing is supplying the anchors and mooring system. All being well, the demonstrator will be installed at the SEM-REV test site, off the coast from Le Croisic, west France, next summer. Ideol has also been selected in partnership with Quadran to build a pilot floating project, consisting of four turbines, at Le Gruissan in the Mediterranean Sea, and is about to start work constructing two demonstrators in Japan.